With the closing of Confucius Institutes, China may be heading for a “soft power” war with the West. In September 2014, the University of Chicago shut down its Confucius Institute. Penn State closed their Confucius Institute the following month, citing a lack of “transparency and academic freedom.” Then in January of this year, Stockholm University closed theirs as well. The first Confucius Institute opened its door in November 2004 in Seoul, South Korea. Hanban, or the Chinese National Office for Teaching Chinese as a Foreign Language, which is responsible for the Confucius Institute program as well as the China Bridge competition, gathered speed quickly. In 2006, a new institute was established every four days and Hanban hopes to have 1,000 institutes by 2020. Much of Asia is already awash with the hallyu cultural references attendant to South Korean soap operas and the lyrical flourishes of its pop music icons. Japan isn’t hurting either. Indeed Japan is arguably the Asian darling of the Western imagination, known and respected for its advanced technology, exquisite cuisine, the stunning efficiency of its cities and the remarkable politeness of its citizens. On the other hand, Chinese products are still associated by many with shoddy quality and the vulgar behavior of Chinese tourists continues to make headlines the world over. The soft power push isn’t restricted to Asia either. Alliance Française promotes French culture and language while British Council does the same for British culture and English. Counterparts to these include Instituto Cervantes for Spain, Instituto Camões for Portugal, Goethe Institut for Germany, and, of course, Confucius Institute for China. 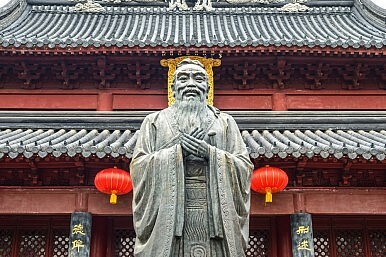 Confucius Institute is operated through the Ministry of Education and, in addition to its academic goals, it wields considerable political power. Like Japan, Chinese soft power is hamstrung by history. In “Repackaging Confucius: PRC Public Diplomacy and the Rise of Soft Power,” Guo Xiaolin observes that in 1978 Vice Chairman Deng was Time magazine’s “Man of the Year.” China, at the time, seemed full of promise. Yet after the 1989 Tiananmen massacre, “China lost any veneer of ‘panda-like’ innocence it may have had.” This lost innocence was not regained until December 2003, when Prime Minister Wen Jiabao delivered a speech at Harvard University. According to Guo, this speech introduced the idea of China’s “peaceful rise.” Confucius Institute exists to support this rhetoric and Chinese soft power in general. After all, Guo writes, its founders were propaganda officials and Marxism-Leninism academics. There were protests by Chinese in September 2014 leading up to the decision by the Toronto school board to end ties with Confucius Institute. Some protestors complained the school board did not want Chinese children learning their own language, and they were offended that the Canadian government could be so prejudiced. Yet one can easily imagine what the Chinese government would do if British Council in Beijing began offering English classes to Chinese in which they taught about the Tiananmen massacre. This is how Chinese soft power differs. Other nations promote positive images of themselves for the sake of political profit. China lies and censors, and the world sees through its con. China is more abundant with cultural wealth than most nations, and, if it simply told the truth, people would listen. But to tell the truth, China must first face that truth.